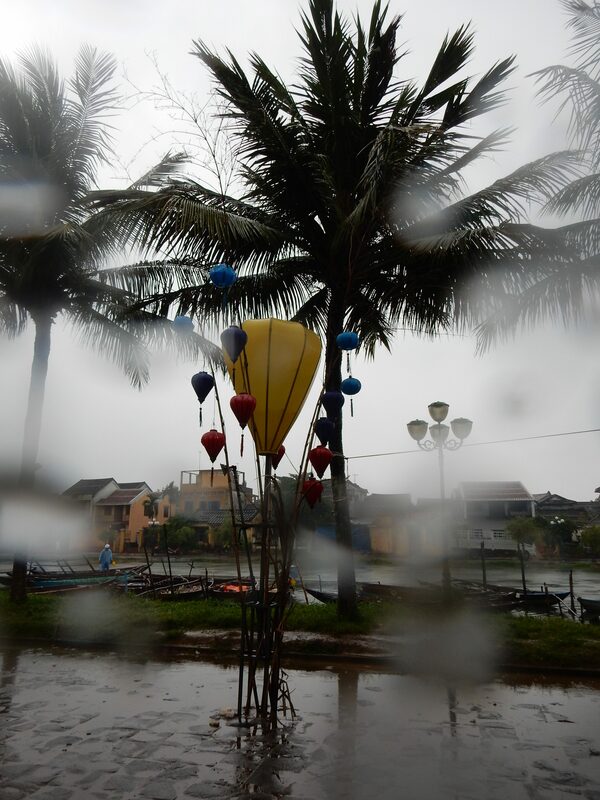 Yesterday: Hoi An, tourist village extraordinaire…Let’s see…where were we? I know…yesterday evening in Hoi An. We are street walkers in a quaint village brimming over with tourists, that nevertheless manages to retain a low-key pleasantness that’s hard to match. Vietnamese people have a dignity about them that’s apparent in stores and restaurants and crowds—it’s something about the upright way they hold themselves and a politeness that’s half friendliness and half maintaining a comfortable distance. It’s a compatible place in which to be out and about. We had our favorite Vietnamese coffee of course and I had a cotton shirt made in two hours because the things I brought are too hot (or unlaundered) and Hoi An is tailoring-central we are told. This was followed by a night and morning of wind and steady beautiful rain…beautiful rain…beautiful rain. Lace and I braved the scary elements for a brisk morning walk, soaking ourselves to the bone but feeling all happy and healthy at the same time. It’s about 5pm now, our laundry’s already been sent out and Lace is on a reconnoitering for tomorrow. I have to tell you the truth that Asia is not on my list of places to visit…I am old and not much time to visit places…however, after reading about Viet Nam from your perspective, well it is now on my list, well, at least it is on the list. Sounds very interesting…culture,food, etc. That is why I like Santa Fe so much…so different from every place else. Sounds like Viet Nam. Your photos and comments are very appreciated.